What You Must Know About Notary In India? According to the Indian Law, a Notary Public or Notary is a person who is authorized to carry out certain legal formalities/activities. This would include drawing up and/or validating contracts, deeds and other such legal documents. The primary role of a Notary Public is to act as an impartial witness while discharging fraud deterrent activities related to legal documents. Such an act is usually referred to as notarization. The Central Government, for the whole or any part of India, and any State Government, for the whole or any part of the State, may appoint any legal practitioners or other persons as notaries, who possess such qualifications as may be prescribed (Section 3 of the Act). Under the Notaries Act, 1952, the Central or State Govt. may appoint one Notary Public for a region or for the whole country or a whole state or a part of the state. The rates of fees to be charged by a notary shall be displayed by him in conspicuous place inside as well as outside his chamber or office. In addition to the above fees, a notary may charge the travelling allowance by road or by rail at the rate of rupees five per kilometer. Rule 12 of the Notary Rules, 1956 prescribes that every notary shall use a plain circular seal of a diameter of 5 c.m. bearing his name, the jurisdictional area in which he has been appointed to exercise his functions, the registration number, expiry date and the circumscription ‘NOTARY’, and also the name of the Government which appointed him. The Notarial Seal acts as a seal of verification meaning that the facts mentioned and the signatures on the document are indeed authentic. It also acts as validation for the fact that the identities of the people signing the document have been verified. It helps prevent forgery and is one of the foremost ways used to avoid frauds in legal documents. In any legal proceeding, a Notary seal, if present on a document, will act as confirmation for the courts that the signatures were placed by a genuine person and not forged or fabricated. It also acts as proof that the individual was not forced into signing it. As one of the many functions of a Notary Public is to witness the document being signed, notarization renders a document authentic, true and voluntarily drafted in many senses. Rental agreements are one of the most common legal documents made in our country. Ever wondered whether a rental agreement or a lease requires notarization? The law does not mandate that all legal documents be notarized. However, for some, it is mandatory. For those documents where notarization is mandatory, lack of it can lead to the document being declared legally unenforceable or invalid. If you do not notarize your documents, you are robbing it of a layer of authenticity which could potentially get your document rejected in court cases or similar scenarios. Rules and therefore, consequences relating to notarization or the lack of it vary from state to state in India. But the summary is that if you do not notarize a document, its legally validity and authenticity will be doubtful. How To Become A Notary Public In India? Create Valid & Enforceable Documents With LegalDesk! All your legal document requirements can be met with LegalDesk. We have a host of pre-drafted, templateswhich can be customized and made yours in just under a few minutes. What’s more? You can opt to have your document printed on Stamp paper and delivered to an address of your choice. All of this and you don’t have to step out of your home! Go ahead, give our list of legal documents a try! There are 19 comments on "Who Is A Notary Public?". I have work experiance in Bangaluru as civil advocate. i want to become notary in maharashtra. What is the procedure? Can i notarized agreement after two years of done the agreement. Sir, we have made a retirement of partnership deed 3 years back, and we did settled the amount to the person also but didn’t made any registered documents, instead of it we made a agreement and attested by notary public, now the problem is the person who has retired from the deed, asking more money for registration. Is the document which is attested by notary public valid, is it legally helpful?, Please provide good advice. Sir, I have drafted partnership agreement at Orissa on Orissa stamp paper. 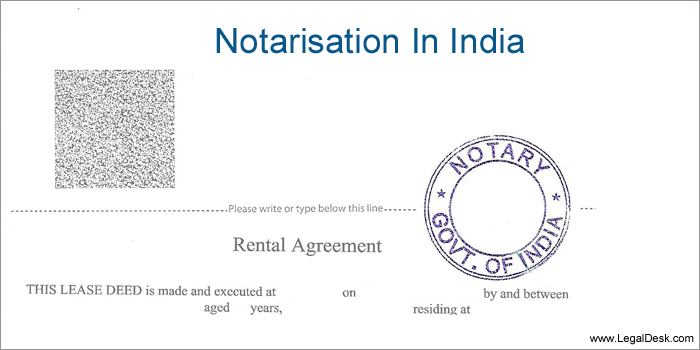 If i get the notary done in Kolkata, will it be considered valid? I have made an agreement for purchase of industrial gala in January 2001 and still in possession of it. I have not notorised iot. Can I notorise it now?